Yesterday we looked at Kirby's Blowout Blast, one of two Kirby games Nintendo released for this 25th anniversary year of the pink puffball. Now, we turn our attention to this year's first Kirby offering, Team Kirby Clash Deluxe, a freemium model boss rush for all intents and purposes. Here's the SuperPhillip Central review. There's no "I" in "team", but there is in "freemium". 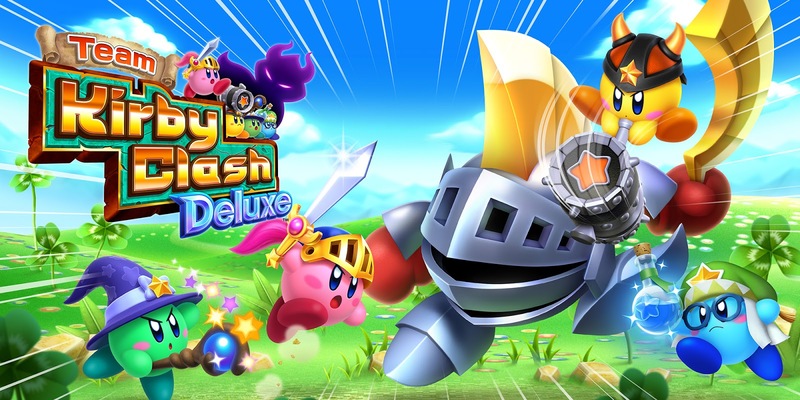 Like the previously reviewed Kirby's Blowout Blast, Team Kirby Clash Deluxe is an expanded version of a side game originally seen in 2016's Kirby: Planet Robobot. However, unlike Blowout Blast, Team Kirby Clash Deluxe requires no cost for the price of entry. While this may sound like a great thing, Nintendo's desire to bring a freemium mobile model to the world of Kirby of all franchises makes for a dissatisfying end result. 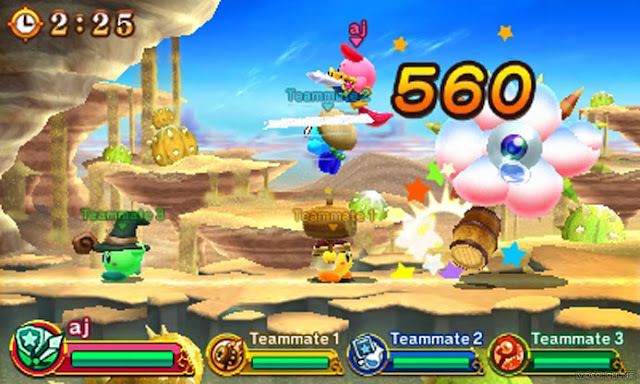 Team Kirby Clash Deluxe's gameplay is comprised of various boss fights. It's a boss rush game essentially that, as you beat bosses with up to three other Kirbys, unlocks new, more progressively challenging bosses to take on. 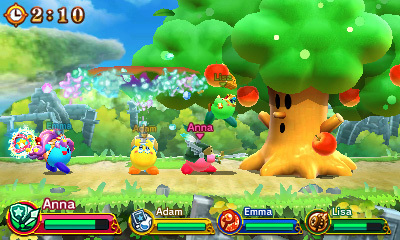 The assortment of boss characters seen in Team Kirby Clash Deluxe should entice all Kirby fans no matter their history with the series, as bosses ranging from classics like Whispy Woods and Kracko to more modern bosses from recent releases like Kirby's Return to Dream Land and Kirby: Triple Deluxe are represented. The apples fall far from this tree, as they're one of the means bad ol' Whispy Woods attacks. Battles have you choose between one of four Kirby types: the standard and equal in power Sword Hero, the strong but slow Hammer Lord, the magic caster Beam Mage, and the healer of the group Doctor Healmore, outfitting them with the necessary equipment. You bring four characters into fights, including yourself, and you choose which roles your AI allies are tasked with. Fighting in Team Kirby Clash Deluxe is quite simple with no fancy-schmancy inputs to remember, just the attack button in different directions launch different attacks. The more powerful the attack, the longer it takes to charge up for it and the more vulnerable it makes your Kirby to use. Fallen Kirbys in battle can be revived, though the process takes a little bit of time, and Kirbys can be healed in battle by passing along food that appears on the battlefield. A super attack can be unleashed through all four Kirbys collecting a stone shard and timing their button press correctly to deal heavy damage to a boss. As for the bosses, they can range from relatively easy to ridiculously frustrating, but it all depends on your Kirby's level. As you fight and complete battles, you earn experience points which your Kirby uses to gain stat increases. This allows you to be better prepared to take on higher ranked foes without as much of a problem. One might think that all one has to do is battle the same bosses over and over again to possess enough power and defense to engage higher difficulty bosses, but this is where the freemium model Team Kirby Clash Deluxe has rears its nasty head in. Unfortunately for Kracko, those aren't tears of joy. With the model the game uses--and is traditional for this type of model--there is a lot of waiting involved. You can't continuously play and engage in boss battles because you consume Vigor for each battle you wage. This takes a sizable amount of time for your Vigor meter to replenish, but being a freemium model, of course, there are ways to get around that, such as using Gem Apples. Now, these can be received for free from a 12-hour drop, earned in a limited and finite fashion from completing in-battle goals, or they can be purchased with real world money. The problem here is that Team Kirby Clash Deluxe would be an immensely better experience for players and a greater experience for consumers if the game was just a one-time buy where the requirement of waiting to continue wasn't there. As it is now, I can't really get into the game for an extended period of time or for a fulfilling session because as soon as things heat up-- OOPS! I've run out of Vigor and can't play anymore. Now that the negatives have been fanned out towards Team Kirby Clash Deluxe's freemium model usage, let's go to one positive for me. The game supports local play for up to four players, so since the game is free to download, you can easily have four friends and/or family members team up together to take on bosses. This is a solid plus of the game's model used. 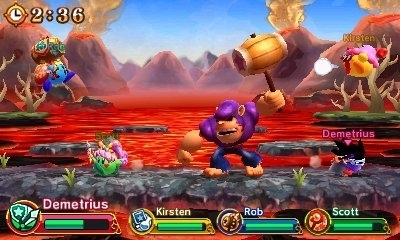 Shellacking a mallet-using monkey with friends is always a good time. Between battles, you lounge around a hub area where you're able to buy new equipment and items, acquire the game's currency through a daily drop, scan amiibo to receive extra materials that would otherwise take longer for you to make new equipment, and input what limited passwords there are in the North American region for bonus goodies. If you're a sucker for outfitting your custom Kirby with the coolest, strongest gear, then you might get hooked to the equipment aspect found in Team Kirby Clash Deluxe. If you have the patience or want to invest the money into Team Kirby Clash Deluxe, there is plenty of content to be found once it finally opens up. You can aim to get every goal completed in every boss battle, in addition to earning up to a platinum on every battle. I just wish I could have all of the content up front, but perhaps that would make the game a breeze to speed through. As it is, though, the route Nintendo took with Team Kirby Clash Deluxe is one that I begrudgingly went along with. For the appealing boss rush gameplay, the game is at least worth a try. That try IS free, after all. It's just the waiting game or unlimited money you can invest in the game aren't.